To better understand the inexplicable dark matter that seemsto dominate the universe, scientists have modeled how supermassive black holesgobble up this strange brand of cosmic stuff. Dark matter does not reflect light or interact with ordinarymatter except through gravity. So when dark matter is swallowed by a black hole,it behaves somewhat differently than normal matter, the new study found. For example, as normal matter falls toward a blackhole, it heats up and radiates light. The radiation can be so intense thatit actually halts the accretion of matter onto the black hole at whatscientists call the Eddington limit. But because dark matter doesn't emitlight, this effect doesn't apply to it. Without counting dark matter in the mix, the Eddington limitwould make it hard to account for how some supermassive black holes got somassive. "There's probably a consensus that you do have toinvoke at least some accretion of darkmatter onto the black holes to explain how they got so big," saidstudy leader Xavier Hernandez, an astrophysicist at the National AutonomousUniversity of Mexico. And because the Eddington limit does not apply to darkmatter, the researchers discovered that if dark matter is sufficiently dense inthe immediate vicinity of a black hole, it can fall in extremely rapidly in aprocess they call runaway accretion. "The bigger it gets the faster it accretes, and thefaster it accretes the bigger it gets, so you end up in trouble,"Hernandez told SPACE.com. 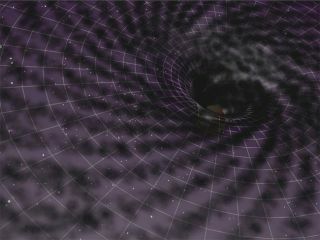 Runaway accretion would cause black holes to balloon soquickly, engorging so much dark matter that the entire surrounding galaxy wouldbe distorted beyond recognition. "When you go the extreme range of black hole masses,you find this effect can be dominant and will actually lead to the black holeswallowing up the whole galaxy," Hernandez said. But this does not seem to have happened to the supermassiveblack holes thought to occupy the centers of most galaxies, including theheart of our own Milky Way. That means that dark matter probably can't be toodense there. Since some models of galaxy formation do call for extremelydense dark matter clumps at the hearts of galaxies, these findings may forcethose models to be reconsidered, Hernandez said. Another explanation for the lack of runaway accretion inmost supermassive black holes could be that the physics of how dark matterinteracts with itself is still misunderstood. Just because dark matter doesn'tinteract much with normal matter doesn't necessarily mean it doesn't interactmuch with other dark matter, Hernandez said.